When shopping for a new vehicle it is best to comparison shop. This can help you compare different models like the best crossover vehicles to the best mid size truck. If you have a small family and are intrigued by crossover vehicles, you may also want to check out sedans as they can be less expensive and offer great fuel efficiency. 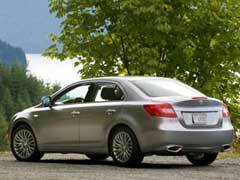 Here is a look at the ten best mid size sedan models. 1. The Dodge Avenger is a great buy as it offers drivers a stylish ride with many great features like suspension refinement. Additionally, for its size it offers excellent gas mileage making this one of the best 4 door sedan cars to buy. 2. For those that want luxury in their ride the Chrysler 200 is a good find. You have a choice of engines including both the V4 and V6 and it has all the styling refinements you would expect from Chrysler. 3. Another model to make the list of best mid size sedan cars is the Kia Optima. The Kia combines performance and technological benefits to make this an excellent ride at an affordable price. 4. Along with Kia, Hyundai has one of the best family sedans. Their Sonata comes with plenty of interior room and the gas mileage is superb as it gets up to 35 mpg on the highway. 5. The Volkswagen Passat is among the best mid size sedan cars families can buy. It has a diesel engine that is big on power and can get up to 43 mpg on the highway. Best of all, for all its features it’s one of the best priced models. 6. The Nissan Altima is a great ride that has plenty of interior space and a great engine. Additionally, drivers will love the performance this ride provides as it has innovative features like steering feedback. 7. The Ford Fusion is the perfect combination of ride performance, safety and cool electronic features. Families will enjoy how much they can do with this ride and with the price tag they will save money in the process. 8. Of course we cannot talk about the best mid size sedan models without mentioning the Honda Accord. Honda has a reputation for making some of the most durable cars on the road, so customers can feel confident that their investment should have long term payback. 9. The Toyota Camry is another model that has a sharp interior design look with the feel of a high performance ride. Drivers will love the engine power, comfortable ride and better braking. 10. The last to make the list is the Chevrolet Malibu. It has a competitive price and great crash-test ratings thereby making this a smart buy for drivers.